【 Good Eye Protection 】 Made of 5500K LED which produces soft Eye-Care Lightning Source, flicker-free and anti-glare light without ghosting to relieve eye fatigue. 【 Touch Sensor Switch Dimmer 】 The smart touch sensor helps you get the right flow that does not affect your eyes. The light looks like Natural light! 【 360° Flexible Goose Neck 】 This reading lamp's neck made of Free Twisted Tube, which can be 360° adjustable. You can put the light on right position exactly where you want. 【 Large Clip Range 】 The Widened Clamp up to 5cm, you can clip it to books, Kindle, shelves, magazines, keyboard, music stands and more. 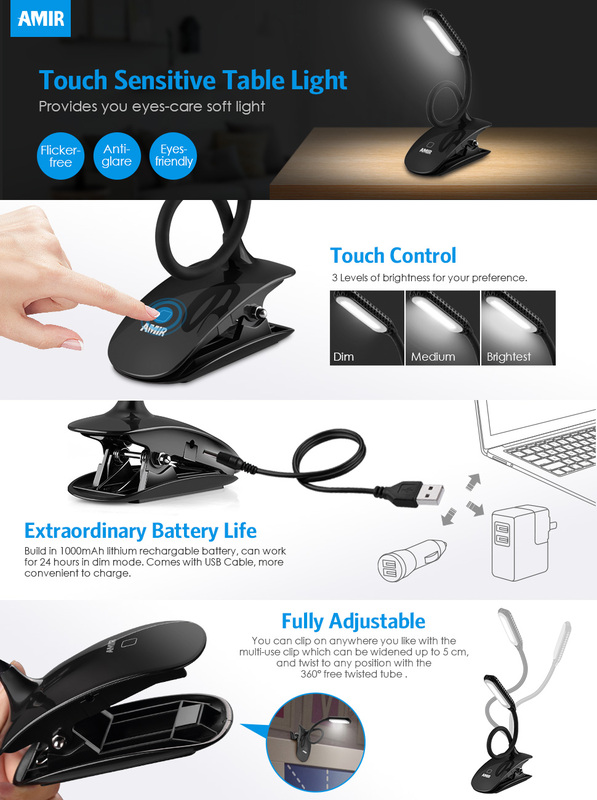 【 USB Rechargeable 】This AMIR Book Light can be powered by USB charger, plug and play, notebook PC USB, Mobile phone adapter, Car USB and etc. 【 Extraordinary Battery Life 】Built-in 1000mAh rechargeable lithium battery, which can work for 24 hours in dim brightness mode: 12 hours in medium light and 6 hours in the brightest light. Energy-saving! 1. when the clip on lamp dimmed should stop using, charging as soon as possible, otherwise it will affect the battery life. 2. after the purchase of the product at least 4 hours before charging. How to plug it in to charge? It comes with USB cable. 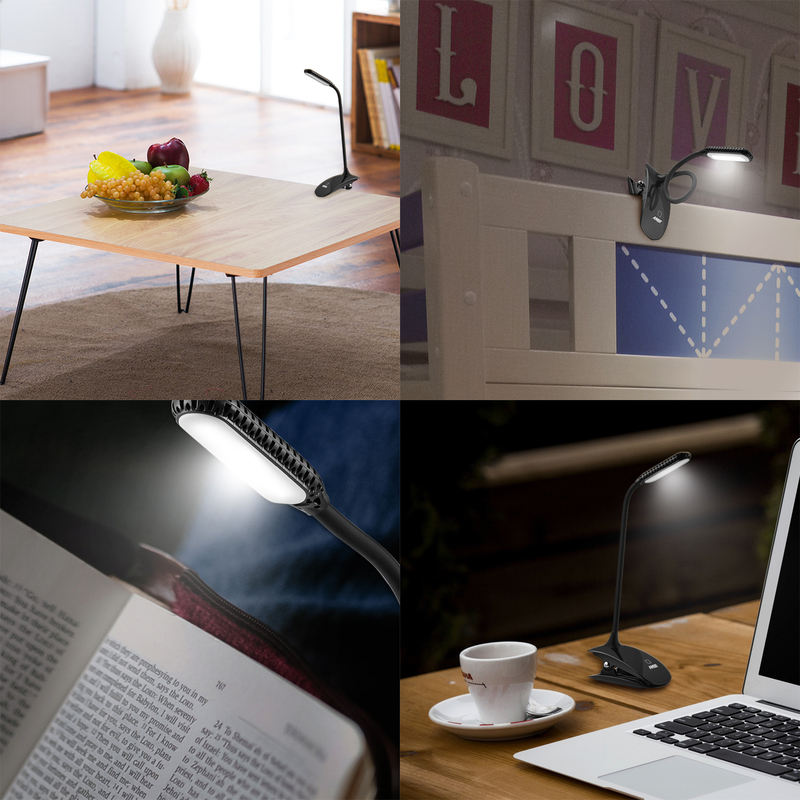 This book light can be powered by USB charger, plug and play, notebook PC USB, Mobile phone adapter, Car USB and etc. How many lumens? What is the color temperature? Where's the engineering science in this product? What is it? There are two brightness modes.It is 40lumen at full brightness and 20lumen at half brightness.The color temperature is 6000K. How many lights does this unit have? It's one light with 5 little bulbs. It lights up the page of a standard size book very nicely. I bought it for my husband and he is very happy with it. It is powered by USB charger, notebook PC USB, Mobile phone adapter, Car USB and etc.